Humble Japanese, trying to de-mystify Singapore cuisine and food culture. This is not a restaurant / stall rating blog. I have been collecting data of Singapore food since 12 years ago and found out that I have visted 60+ chicken rice stalls in Singapore. These are of course recommendation by my friends, by some foodie blogs and also the ultimate guide: Makansutra. I don't know how many of great places to eat chicken rice exist now but I do frequent few stalls that I am comfortable with, they are delicious but within my vicinity. My notes are simple, why is this chicken rice particularly good, why is it special and if I were to change some things, what will it be? Plus of course I note on the rice, the sauces and the chicken and sometimes gravy. When I go back to Tokyo, the first thing I do is, I eat chicken rice at my joint and check to see if we are on the right track -I think we are, fortunately. BTW, if you can guess the name of the chicken rice stall of top foto, you know what's up. Through people's blog (mainly Japanese ones of course), I often witness a comment that says: the chicken rice at Hainan Jeefan Shokudo is close to the ones in Singapore. "Close to the ones in Singapore?" But what exactly is an authentic chicken rice? I just want bloggers to clarify the authentic taste of chicken rice before jumping to conclusions. My conclusion is that chicken rice is pretty much a food that has many variations and flavors are diverse. I don't think there is one true definition of chili sauce -ex. Boon Tong Kee has quite a sweet note but Yet Con is more like flavored Chili Boh etc. This extends to rice, gravy and chicken -textures, flavors, doneness -they all depend on the stall's philosophy. If they don't serve ginger sauce, will it seize to be an authentic chicken rice or vice versa? If the stall pours gravy on the chicken, will it seize to be an authentic chicken rice? You decide. People in Japan who have travelled to Singapore (tourist) tend to standardize chicken rice authenticity with Chatter Box's chicken rice (but chicken rice is not all about Chatter Box). Expats who have lived or who live in Singapore do the same but they prefer Tian Tian and Wee Nam Kee (likewise chicken rice is not all about those outlets either). So generally speaking, if the taste is not up to par with those outlets, they tend to categorize chicken rice served in Japan as "not authentic" or close. I myself am aware of the diversity in flavors of chicken rice served in Singapore after visiting so many so I enjoy that difference and in my book, they are all authentic in their own way. What matters is, does it taste good? I don't remember seeing dry bak kut teh on the menu 20 years ago but nowadays in Singapore, there are few places you can order this dish at some bak kut teh joint, especially klang style bak kut teh shops for this "dry concept" came from Malaysia. Two of the shops I ate had the same style: the ribs and pork belly were tossed with sweet soy pork stock reduction sauce with dried chili (but not fiery, just for flavor and texture), okra and julienned dried cuttlefish. Actually, the combination of dried cuttlefish and pork is not bad -just like pork and dried shrimp combination. Interesting that both of the restaurants I visited gave me a bowl of Teochew style (pepper and garlic) soup. But I find this dry bak kut teh a misnomer -perhaps rather than writing Kung Pao Pork Rib on the menu, writing "dry bak kut teh" arouses more curiosity (I certainly became curious). But if you expect the flavor to be Bak Kut Teh, you will be disappointed. Nonetheless, it is a flavorful dish that goes incredibly well with rice. Introducing the unknown, ladies and gentlemen, -mee kuah. Being Singapore food gastronaught that I am, I did not hesitate to eat this shockingly red stuff, I mean noodle. Of course the red coloring does not come from spices, but non other than food coloring. If they didn't add any coloring perhaps this dish would have a slightly brownish color like sup kambing (or mutton soup). Mee means noodle in Hokkien dialect and kuah is gravy in malay. The kuah is definitely a sauce from sup tulang or bone marrow soup a.k.a. tulang merah - uniquely Singaporean dish of stewed mutton bones with some sweet-spicy sauce (pics below). For all I know, only mamak stall sells this stuff along with their famous sup tulang. (mamak is a term for Indian Muslim men living in Singapore and Malaysia. According to a Penang cookbook which I have, mamak originally means "uncle" in Tamil language). It's got some slightly spicy kick and sweetness (which I don't really think it needs to be this sweet -my personal opinion). Although spices used are very subtle -maybe some chili powders and some black or white pepper powder. If there were other spices like cumin, coriander or fennel, I would definitely taste it -for it will be more like a curry. Inside is chopped mutton bits and shredded cabbage and some poached/fried egg with other garnishes like potatoes, green chilies and green peas. I wish there were some sprinkles of chopped cilantro to balance the flavors, it definitely needs some herbal kick to this dish. The kuah or the gravy has quite a strong mutton flavor so maybe some julienned fresh ginger would be also nice. It should cut the yucky sweetness. The gravy is also thickened with some kind of starch -potato or corn or something so that it clings nicely to the noodles. Some places add chopped green chili to this and I think that is a damn welcome addition not only for flavor but texture-wise and for visual appearance. Anyhow, I would not recommend this dish if you are wearing white shirt. I'd say they should cut the noodles into bits like katong laksa and so one can eat it with a spoon and not slurp this. I don't know maybe I should wear a red polo shirt next time (if there is next time...). In recent years, ramen business is booming in Singapore. 10 years ago, ramen did not have a reputation it has now and it has that trendy image so to speak -eating ramen. Now, I am always amazed how Singaporeans are so pro-Japanese food and with the recent launch of hot-shot star rated Japanese dining at MBS and Sentosa, the recognition (Japanese food) is getting even bigger (I am glad to witness that because I love Japanese food, quite naturally). Anyway, I do not eat ramen in Singapore because I am there to eat local food so I won't comment on how good Tonkotsu King is or Ippudo is. Actually, I don't frequently eat ramen in Tokyo either and I don't go hunting ramen trends here in Tokyo. I just eat at my comfortable nearby places. 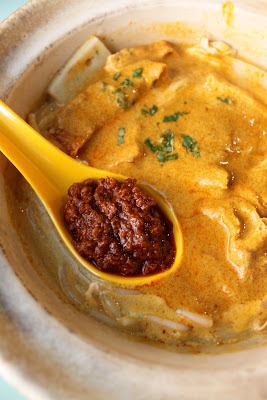 To a foreigner like me, Singapore is a noodle heaven with wide ranges of noodle dishes from coconuty laksa to irresistible bak chor mee, lor mee, char kway teow, hokkien mee, prawn mee, wanton mee.... the choices are simply mind boggling -and they are all amazing -textures and flavors. I am not comparing ramen and local noodles (let me simply call it mee here). But I think this "mee" is taken for granted, its got a lot of potential to be better but cannot. Why? Correct me if I am wrong, a bowl of ramen costs 12-SG$15. That means, they could spend more money on quality ingredients so, if the food cost is 30% (average on ramen), they spend $4-$5 on ingredients! The photo pic, claypot laksa at Depot Rd. Zhen Shan Mei for a small size is only 3 bucks. If they use a higher quality ingredients and sell it for say, $7, they will go out of business because people will start patronizing other stalls that sell laksa for a lesser price. My point is, a famous stall such as this laksa stall cannot raise prices in order to improve the flavor of their current laksa. The selling price is determined by the consumer not the stall owners. In the past 10 years, prices of ingredients and utility bills have inflated but the bowl of noodles remains the same or simply 50 cents or so higher. This means the profit margin is getting less and less for the stall owners. Low profit margin means bad business. On top of this low profit margin, comes long hours of hard work, day off once a week, namely, hard labor. Popular ramen joints do purchase, high quality ingredients and that is why the soup tastes good or toppings such as braised pork tastes good. Food is all about ingredients of course. Lame ingredients yield mediocre food, it's a fact. Singapore mee dishes have a lot of potential because people cooking it do not have such liberty to use better ingredients (although, with cheap ingredients, I think they do a great job selling it for 3 bucks...) given the current selling price. If they use better ingredients, their food would taste even better of course. I do not mean use lobster in prawn mee or those kind of gimmicky make-over. Just better ingredients like more shells or pork bones for example -an ingredients needed to beef up the flavors. If the Singaporean consumer do not have a mind shift in hawker prices, this is not going to happen (don't get me wrong though, I do also acknowledge that some people cannot afford to pay $5 for a bowl of mee, what I mean is, there should be more places with stalls with differing selling prices like ramen -you can find ramen in Tokyo for 300yen or you can find it 5 times that price, easily. The difference is quality ingredients.). Sadly, with high food cost and long working hours, working at a hawker stall is not a dream job for young Singaporean to-be-cooks or young entrepreneurs. Lack of successor is a grave problem and it definitely is starting to show. Graduated from LSE (London) & CIA (NY)。 Owner of 海南鶏飯食堂 Hainan Jeefan Shokudo in Azabu & Ebisu, Tokyo. Average annual visit to Singapore: 3 times. Deeply concerned about future of hawker stalls. Representing Japan's Singapore food geek.